Measurement Resources has helped Western Youth Services (WYS), a youth-serving mental health organization in Southern California, strengthen their programs with research and evaluation services since 2014. Measurement Resources’ work has included literature reviews, high-performance measurement frameworks, impact evaluations and social return on investment calculations. 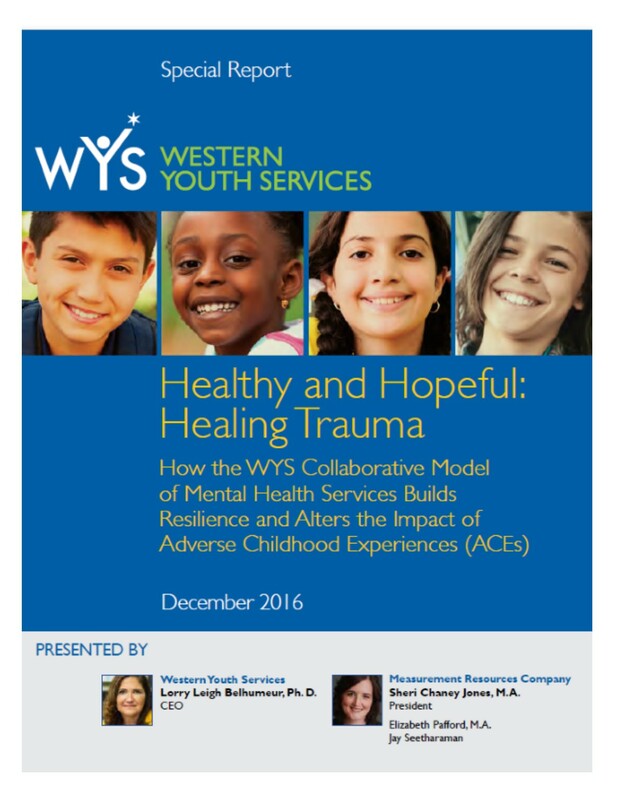 WYS works with children who have experienced adverse childhood experiences (ACEs) with the goal to reverse the impact of these experiences on a youth’s life. Individuals with ACEs and untreated mental illness are more likely to be involved with publicly-funded systems at some point in their lives. These systems include Medicaid, social security disability insurance, jail and/or incarceration, drug treatment, foster care and homelessness programs. Additionally, individuals with mental illness are likely to have reduced incomes when compared to their counterparts. Measurement Resources conducted an independent impact evaluation of WYS programs to demonstrate the impact of WYS’s unique collaborative model. The research also calculated the social return on investment of these programs. When the youth in Anaheim County were served by Western Youth Services’ evidence- and school-based mental health program, it led to a community cost reduction of approximately 68 percent, or more than $31 million! For every $1 invested into this program, the community saved more than $6 in future and ongoing community costs.